Some anglers are not interested in compromising when purchasing a fish finder; they want one of the finest models available on the market, and they are willing to pay premium prices to do so. Such anglers often find themselves perusing the Humminbird HELIX 12 Series, as they are some of the most feature-packed options available. All of the models in the series provide an impressive amount of data, but the Humminbird HELIX 12 CHIRP MEGA SI GPS G2N provides more information than any of the others in the product line, and appeals to most advanced anglers, who are seeking a professional-caliber fish finder. Additionally, because it is easy to upgrade the software of this unit or even connect several different HELIX 12 fish finders together, the sky is the limit for anglers using these tools. Because the HELIX 12 CHIRP MEGA SI GPS G2N includes almost every feature available among modern fish finders, and most anglers have found the unit effective and easy to use, Fishing Tech gives this model an A+ rating. And although the other models in the series lack side imaging capabilities, they are still very nice fish finders, which will surely help you find and catch more fish, we give the entire series an A rating. Many high-end fish finders provide scanning sonar capabilities. Most such units do so by including a downward-looking unit, which enables you to see things below the boat in great detail, and a few fish finders even include side-looking scanning sonars. However, the HELIX 12 CHIRP MEGA SI GPS G2N features advanced scanning technology, which relies on much higher frequency signals than traditional down- and side-imaging do, thereby providing much greater detail. Some fish finders have “blind spots,” which can prevent you from seeing all of the fish and structure available to you. However, the HELIX 12 CHIRP MEGA SI GPS G2N eliminates this possibility by providing 360 degrees of high-quality images. This way, you can be sure you’ll see everything of note around your boat. Most anglers shopping for high-end fish finders want a unit that will not only help them to find the fish, but to navigate as well. The HELIX 12 CHIRP MEGA SI GPS G2N excels in this capacity, as it not only includes a precision GPS module and chart-plotting capabilities, but it also includes a high-definition radar unit. This way, you’ll be able to safely pilot your craft in foggy weather or low-light conditions. Like most of the other high-end HELIX Series product lines, the Humminbird HELIX 12 is available in four different option packages. Each model in the series is well-built and easy-to-use, but you’ll have to pay more for models with advanced features, such as MEGA down- and side-imaging. There is a wide price discrepancy between the lowest and highest priced models in the HELIX 12 lineup, with the most expensive units providing the greatest slate of features. The HELIX 12 CHIRP GPS G2N, for example, does not provide scanning sonar capabilities. The next model in the series provides CHIRP down-imaging, yet it does not provide MEGA imaging, as the two most expensive models in the series do. Both of the two most expensive HELIX 12 models provide scanning sonar, but only the most expensive model – the HELIX 12 CHIPR MEGA SI GPS G2N – provides side-imaging capabilities. These side-imaging capabilities come at a considerable price, and you’ll pay about $500 more for the ability to see things lurking to either side of your boat. The HELIX 12 CHIRP MEGA SI GPS G2N is a feature-packed fish finder that includes a variety of basic and high-end features to help you find and catch more fish. A few of the most notable features and capabilities of the unit are detailed below. If you’d like to connect several different HELIX 12 fish finders to maximize your fish-finding abilities, the included ethernet connections give you the ability to do so. You can also use the ethernet connectors to connect several head units to a single transducer. SwitchFire takes much of the guesswork out of fishing. Rather than searching aimlessly for the locations holding fish, anglers can use the recommendations provided by the HELIX 12 CHIRP MEGA SI GPS G2N to narrow down the number of places in which you must search. SwitchFire analyses historic patterns, weather and temporal data to provide suggestions regarding the places most likely to contain fish. You have to be able to see the data presented on the screen of your fish finder to use it, and all of the models in the HELIX 12 Series make this easy, thanks to the 12.1-inch HD screen. With this 1280 x 800-pixel, backlit screen, you’ll be able to see the information displayed easily, no matter the weather conditions. The screen takes advantage of a truly massive suite of imaging capabilities. ContourXD Cartography is a professional-caliber mapping package that comes with the HELIX 12 CHIRP MEGA SI GPS G2N. Covering more than 3,000 US lakes, these maps will help you navigate confidently in unfamiliar waters. Additionally, thanks to the included contour lines, you’ll be better able to locate and target sunken humps, points and river channels. It can be frustrating to have to run back and forth between the bow and your console as you try to cast and consult your fish finder at the same time. Fortunately, you won’t have to do so with the HELIX 12 CHIRP MEGA SI GPS G2N, thanks to its wireless capabilities. With this unit, you’ll be able to control your fish finder from afar, enabling you to zoom, switch views or even power off the unit while you concentrate on fishing. Although the Humminbird HELIX 12 CHIRP MEGA SI GPS G2N is a great unit, it does have a few drawbacks. And while most of these are offset by the units impressive features and quality, it is important to consider the strengths and weaknesses of any fish finder before making your final decision. The HELIX 12 CHIRP MEGA SI GPS G2N not only includes a variety of impressive fish-finding features, it also includes a number of navigational aids, including ContourXD charts, HD radar and AutoChart Live, which enables you to create your own custom maps. This HELIX 12 unit provides an impressive array of networking capabilities, including wireless connectivity and ethernet connectors. MEGA scanning sonar technology provides much better detail than conventional scanning sonars do. In some cases, you can even visualize individual fish. Some anglers would prefer a touch-screen interface in a fish finder at this price point. Some anglers may find the user interface a bit complicated and difficult to use. There aren’t any Humminbird HELIX 12 Series fish finders that offer the same slate of features that the HELIX 12 CHIRP MEGA SI GPS G2N does. But, if you are trying to save a little money by purchasing a more affordable model, there are several options from which you can choose. The HELIX 12 CHIRP MEGA SI GPS G2N is the most similar model, and it provides almost every feature that the CHIRP MEGA SI GPS G2N does, except for side-imaging capabilities. However, you’ll save about $500 by foregoing side-imaging capabilities. If you’d like to save an additional hundred dollars or so, you can opt for the HELIX 12 CHIRP SI GPS G2N, but you’ll give up MEGA imaging by doing so. You’ll still be able to enjoy down-imaging capabilities, but they’ll be of the conventional variety, which produces less detail than the models which provide MEGA down imaging. Ultimately, you’ll need to decide whether you are seeking a true top-of-the-line fish finder and are willing to pay for it, or if you’d rather make do with one of the more affordable models in the series. Once you consider spending well into four figures on a fish finder, you are more-or-less guaranteed of obtaining a high-quality product, which will help improve your ability to find and catch fish. However, because you always want to get the best fish finder for your needs (and the best value for your dollar), you’ll want to compare the HELIX 12 CHIRP MEGA SI GPS G2N with a few comparable units produced by other manufacturers. Two good fish finders at a similar price point include the Lowrance HDS-12 Gen3 Totalscan Insight and the Raymarine A128 12-inch Multifunction Display with Wi-Fi and DownVision. The Lowrance model is roughly the same price as the HELIX 12 model reviewed here, but the Raymarine fish finder costs several hundred more. Both of these fish finders provide a wealth of important features, including CHIRP technology, GPS and chart-plotting capabilities and a high-quality, 12-inch display. The Raymarine model is the only one of the three that utilizes a touch-screen interface, which many anglers prefer. But you may not want to pay an additional several hundred for this capability. Both the HELIX and Lowrance models offer side-imaging capabilities, while the Raymarine model does not. Ultimately, it is hard to justify paying the additional costs associated with the Raymarine unit. However, both the Lowrance and HELIX units provide similar capabilities, so you may want to investigate both of these models further before making your final decision. 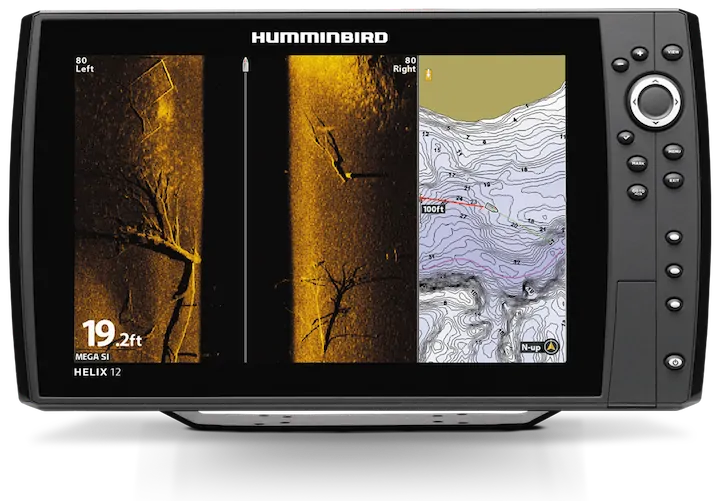 If you are ready to move on from fish finders designed for causal anglers and step up to a unit that will provide you with the type of information and flexibility serious anglers demand, the Humminbird HELIX 12 is a solid choice. And while all of the models in the HELIX 12 Series are high-quality fish finders that will suit the needs of most anglers, the Humminbird HELIX 12 CHIRP MEGA SI GPS G2N is easily one of the most appealing options on the market for anglers who want nothing less than the best. Given its impressive slate of features, networking capabilities and very high-quality display screen, Fishing Tech rates this fish finder as an A+ product.